As healthcare organizations deal with the impact of HITECH, ACA and other changes, it’s more critical than ever to manage resources as efficiently as possible. 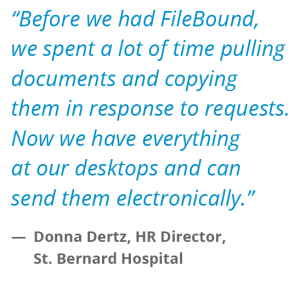 FileBound helps many healthcare organizations, from modest practices to hospitals to insurers, work more effectively and increase productivity. As a result, they are able to better serve patients and control operational costs so that they can maintain and improve patient services. In clinical care settings, FileBound’s document and workflow automation are used to get control of the forms, correspondence, reports and other tasks that exist outside of the EMR solution, distracting staff from providing optimal care. FileBound also manages and stores legacy medical records in a non-proprietary format that can be integrated with practically any EMR, bridging the transition to a fully electronic record. In the business office, FileBound’s proven capability to improve accounts payable and human resources efficiency lets hospitals minimize operational costs. FileBound’s easily configured workflows can manage the complex needs of healthcare organizations in these departments, including credentialing and licensing. FileBound improves cash flow in patient accounting by streamlining the collection of super bills/charge tickets and reconciling EOBs. Reduce operational costs in back office operations to maximize the amount of resources available for patient care. Improve patient service by reducing the amount of time spent on administrative tasks that can be eliminated by automatically applying the rules needed to route documents and complete work tasks. Electronic forms can eliminate some of the remaining paper-based processes entirely. Instead of manually routing work or entering data, employees can focus on patients. Increase productivity by allowing staff to focus on work tasks that add value and truly need human knowledge. This allows providers to meet increased service demand without increasing staffing. Consolidate patient data by ensuring that all documentation – legacy medical records, documents from other providers, insurance documentation, electronic forms and more – is immediately available. Through FileBound’s easy-to-use interface or integration with familiar clinical or business systems, authorized users can access the information they need quickly. Improve cash flow by reducing cycle times in patient accounting and streamlining collections through automation.